M.A.R.C (or the Multi-Actuated Robotic Companion) is a humanoid robotic platform which has been created using 3D printing technology, blueprints and file available on the open source InMoov project (www.inmoov.fr). The focus of this project is to assess the viability of this platform, and others produced by the same mechanisms, as alternative research platforms for robotics. Traditionally, the research platforms used in this field are, of necessity, very expensive; due to their complexity, cost of materials etc. However, with the emergent technology of 3D printing gaining more and more attention and becoming increasingly available to all areas of society, it is possible that production and research of and on complex robotic platforms may no longer be exclusively the domain of those institutions with budgets generous enough to accommodate the hefty price tags that would at one time have accompanied sophisticated robotics platforms. This viability of using these techniques to create feasible, useful research platforms will be assessed in terms of how robust and diverse M.A.R.C is. 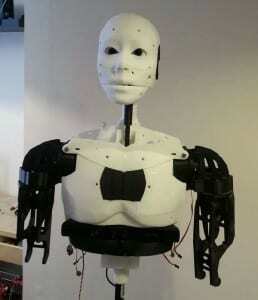 Assessment will take the form of generic research tasks in the fields of human-robot interaction and object manipulation, along with physical stress-tests of components.